The issue of quantitative precipitation forecasting continues to be a significant challenge in operational forecasting, particularly in regions susceptible to frequent and extreme precipitation events. St. John’s, Newfoundland, Canada, is one location affected frequently by such events, particularly in the cool season (October–April). These events can include flooding rains, paralyzing snowfall, and damaging winds. 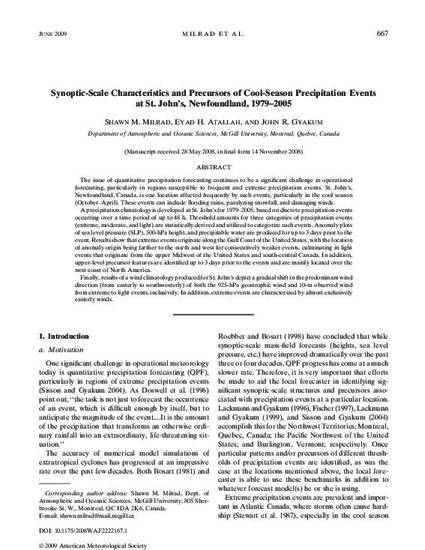 A precipitation climatology is developed at St. John’s for 1979–2005, based on discrete precipitation events occurring over a time period of up to 48 h. Threshold amounts for three categories of precipitation events (extreme, moderate, and light) are statistically derived and utilized to categorize such events. Anomaly plots of sea level pressure (SLP), 500-hPa height, and precipitable water are produced for up to 3 days prior to the event. Results show that extreme events originate along the Gulf Coast of the United States, with the location of anomaly origin being farther to the north and west for consecutively weaker events, culminating in light events that originate from the upper Midwest of the United States and south-central Canada. In addition, upper-level precursor features are identified up to 3 days prior to the events and are mainly located over the west coast of North America. Finally, results of a wind climatology produced for St. John’s depict a gradual shift in the predominant wind direction (from easterly to southwesterly) of both the 925-hPa geostrophic wind and 10-m observed wind from extreme to light events, inclusively. In addition, extreme events are characterized by almost exclusively easterly winds.